Castleford Tigers head coach Daryl Powell was proud of the way his injury ravaged team performed at Hull and felt the final score was harsh on the team. 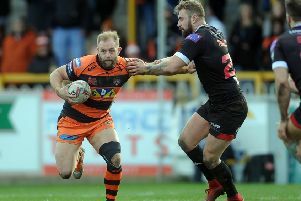 Although the Tigers were beaten by 24 points they created a number of openings and were on the wrong end of some decisions from the officials as they aimed to defy a huge injury list that saw an entire back division ruled out. “I thought we were outstanding in the second half,” said Cas boss Powell. “It was more like us. “I said at half-time we needed to complete at 90 or 100 per cent and we’ll win the game. “There was nothing in the game. I thought the final score was harsh on us. “I’m happier after this game than I was after beating Huddersfield because that’s more of a Castleford performance. Powell was unhappy, however with the standard of officiating at the game. He was left bemused by a number of calls by referee Gareth Hewer, who is not in charge of Super League games every week, and called for video referees to be at all games, not just ones shown live on television. He said: “It’s an absolute shambles, players running outside the shoulder line, nothing gets picked up. “So we have to go back to blokes diving on the floor to show referees who don’t know what they are looking for what to look for. “I can’t believe some of the lines that were run that weren’t picked up. It was a poor and shocking performance from the referee in the first half, basic things that should be picked up weren’t picked up. “We lost the ascendancy through some terrible decisions.